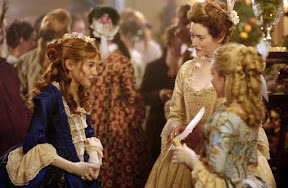 Although the fiercely independent Felicity Merriman (Shailene Woodley) would’ve undoubtedly preferred a pair of breeches and ownership of a local beautiful yet mistreated copper-colored wild mare for her tenth birthday, fittingly for the 1775 time period, Felicity discovers she’s been enrolled in female etiquette studies. Yet while the art of serving tea may have been the cornerstone of women’s education in her mother’s generation, with the Revolutionary War fast approaching, Felicity soon realizes that the question of whether or not to pour or pass the colonists’ heavily taxed English tea has become a political one. Encouraged by her mother (Marcia Gay Harden) to make up her own mind, Felicity is uncertain whether or not she should follow in the footsteps of both her Patriot shopkeeper father and his fifteen-year-old outspoken apprentice Ben or remain a Loyalist to the King like her beloved grandfather and best friend Elizabeth. Moreover, while it’s augmented by a Flicka inspired plot-line as Felicity tames and liberates an abused horse, which conveniently and extremely subtly serves as both a metaphor for both the girl and by extension the Patriots’ desire to be free, to her credit, screenwriter Anna Sandor is careful never to let the political backdrop overwhelm the film. And despite the fact that it’s slightly more predictable and episodic than its made-for-television predecessor Samantha: An American Girl Holiday , which was also based on the American Girl series of historical young adult novels penned by Valerie Tripp, Felicity benefits from a first-rate cast and crew including Samantha director Nadia Tass. Executive produced by Academy Award winner Julia Roberts, whose admirable decision to champion coming-of-age material aimed at the often ignored demographic of adolescent girls should inspire other women in her position to do the same, Felicity: An American Girl Adventure is another wholesome, high-quality effort that puts most big-screen works in the genre to shame.